Car hire in Cyprus: Cars hired in the Republic of Cyprus usually cannot be taken into Northern Cyprus. All rental cars have "Z" plates with black on a red background on front and rear of the vehicle, whereas "domestic" vehicles have black on a while background on the front and black on a yellow background on the rear rather like in the Uk. 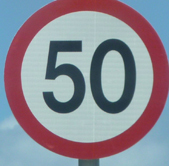 Speed limits : Built-up areas: 50km/h (31mph) major roads outside towns: 80km/h (50mph) major roads outside towns:100km/h ( 62 mph). Distances and speed are measured in km/h not mph, so the vehicle's speedo will of course be in km/h as in the Republic of Ireland. Drink and Driving: Blood alcohol limit is 0.05 More information Here Take great care if you are on holiday and going out to eat. Remember the drink drive limit is very low, so it is safer not to drink when you drive. Seatbelts: Must be worn by driver and passengers in in the front and rear of the vehicle. Children under the age of 5 must not sit in the front passenger seat. Children aged between 5 and ten may sit in the front seat but only if an appropriate child’s seat belt has been fitted. Headlights: The vehicle's lights must be used between half an hour after sunset and half an hour before sunrise. Spotlights are prohibited. Dipped headlights should be used in built-up areas after sunset. 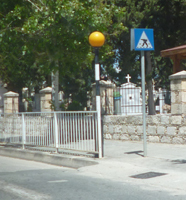 Speed Cameras: Although there are numerous warning signs, there are not too many physical speed cameras. Horns: Use of the horn is restricted to emergencies only. Parking is strictly prohibited at all times on a single yellow line. unlike the UK. Mobile Phones: The use of mobile phones while driving is strictly prohibited. You can get a fine of €85.43 or more. Like in the UK - Eating and drinking whilst driving is prohibited. Don't risk using a mobile phone when you drive as you can receive a heavy fine in most countries and more important cause a serious accident. 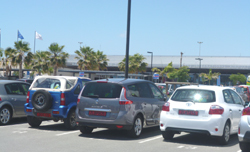 Warning / Emergency Equipment: It is a legal requirement to carry 2 warning triangles however renting a car at Paphos International Airport in May/June 2013 there was not even one with the hire car. 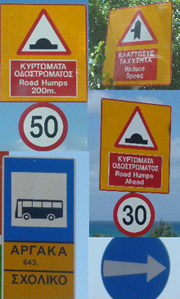 There is currently no official Cyprus Highway Code. There is one in the pipeline which has been agreed by Parliament but it is unlikely to be published before 2011. It will be similar to and have the same legal standing as the UK publication in that it will not in itself be an offence to contravene it, but can be used to assist a prosecution. 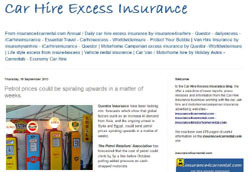 Warning about some car hire companies Fuel Policy: Like certain car hire companies in Spain and Portugal, you need to check the car hire company's fuel policy as several of these are now working on collect full, pay for a full tank of fuel at their price and return empty. This can prove quite expensive if you do not hire the car for several days and use up the fuel. There is also the risk that you might also run out of fuel beforing returning it to your car hire destination (often airports) and then miss your flight. Be prepared to pay an additional Airport collection tax as well. Cyprus is an island in the eastern Mediterranean. Its varied landscapes cover rugged coastlines, rocky hills, forest-covered mountains and sandy beaches where turquoise waves lap against the shore, making it an ideal location for a vacation. The division of Cyprus between the ethnic Greeks and Turks is the obsession of the nation, however, there have been no open hostilities for over two decades. Cyprus is characterised by the Troodos mountains in the centre of the island, the fertile Messaoria plain which runs eastward along the north coast, and the Morphou Basin which runs around the coast in the west. With its neon-lit towns it might seem like you’ve hit Essex on a sunny day. Book car hire Cyprus, drive out of town and discover a world of medieval castles and ancient monuments. Pack your sunscreen, walking shoes and a camera for a trip to remember. We've great rates all year round on Cyprus car hire, so rest assured you've come to the right place for cheap car hire Cyprus. Luckily for us they even drive on the left so you'll be able to whizz around in your hire car without a care in the world. 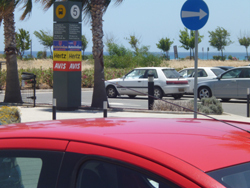 car hire in Paphos - Sun, sand and the Temple of Aphrodite. Paphos is a great place to book cheap Cyprus car hire and explore the island. Bury yourself in history at the Tombs of the Kings. It’s only a mile north of Paphos harbour. History not your thing? Make the drive to Adonis Falls (careful, it’s a bit off-road) and splash about beneath a 10ft waterfall. top driving tip - They drive on the left – just like us in the UK, Ireland and Malta. As there is a long British link with the island, you drive on the left and many signs are in English, there are even red British style post office boxes. After Greek and Turkish, English is the third language. Whether it is a school break or another excuse for a holiday Cyprus is the place to visit. Spring and autumn often attract couples without children, who wish to enjoy the warmth and peace. Many couples decide to spend their honeymoon there. Mythology has it that Cyprus is the birthplace of the goddess Aphrodite, so what better place to come for a romantic holiday. Also, many couples now hold their wedding ceremonies on the island. In a recent survey it was found that the Island of Aphrodite is the third most popular destination worldwide for romantic weddings. The Cyprus Tourism Organisation publishes its own brochure giving all the necessary facts on weddings in Cyprus. While in Cyprus, some holidaymakers take advantage of the Holy Land’s proximity and enjoy a cruise to Egypt and Israel. There are also cruises to Lebanon, Greece and the Greek islands, whilst Syria is just 50 minutes flying time away. Cyprus does not only cater for the summer visitor seeking a beach holiday. Special interest holidays are becoming more and more popular. Sea sports and deep sea diving are automatically associated with the island, nevertheless, The Troodos Mountains and the forests offer so much to the hiker and birdwatcher alike – rugged slopes, towering pines, bubbling streams and an amazing variety of flora and fauna. In the winter months skiing and snowboarding are very popular. Over recent years, Cyprus has become well known in the golfing world – there are already three 18 hole championship courses. A recent innovation is that of agrotourism – Visitors can choose to spend all or part of their holiday in a traditional village house. Many of these houses have been fully renovated to provide all mod cons. Distances are so short on Cyprus that it is possible to combine a stay in a quiet village with a day sightseeing or on the beach. A visitor can even ski in the mountains and have a swim in the sea the same day!